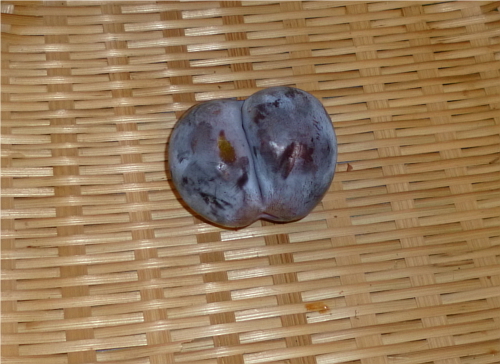 Look at this funny double plum! You'd never see that in the supermarket. 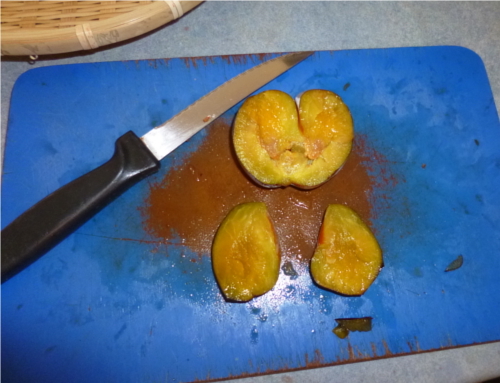 I was curious to see whether it was two plums that had somehow fused together, or one monster plum. There were two seeds inside, so that answers that question. 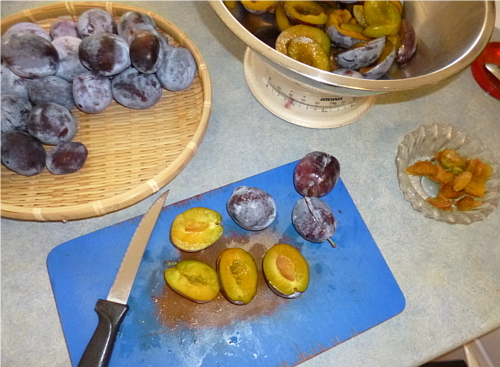 1.4 kilos of plums! I'm quite proud of my little tree. 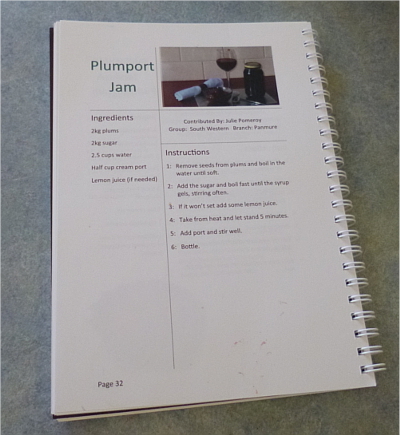 I used this recipe from the CWA (Country Women's Assocation) Preserves cookbook. 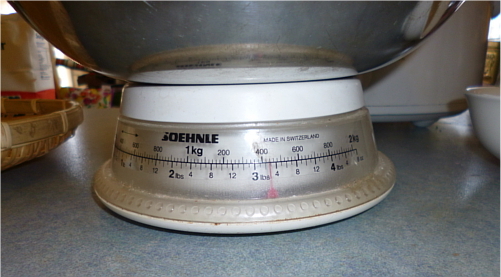 The Association is renowned in Australia for their traditional cooking knowledge. I got this cookbook just before Christmas, and I'm using it already. That's quite rare for me! I decided not to add the port as I wanted to try a 'pure' jam for my first time. 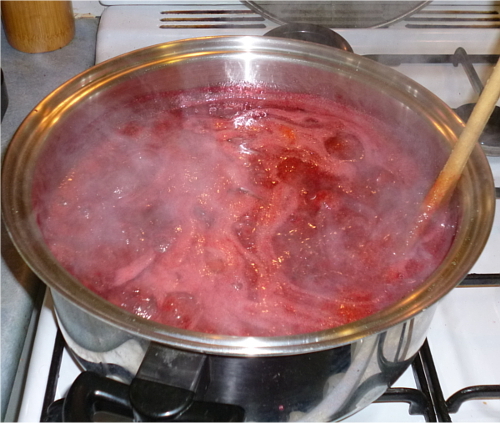 The plums are boiling in a little water until soft. 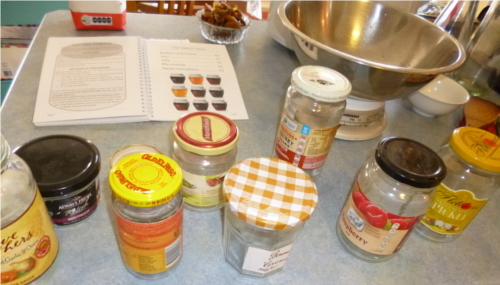 While the jam was boiling, I prepared the jars. First I washed them in hot water and tried to get the labels off as best I could. 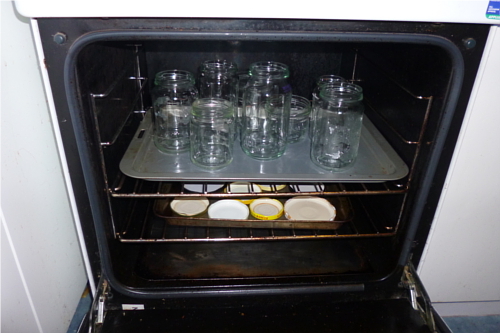 Sterilising them involves putting them in a slow oven for at least 15 minutes. We tested the jam by pouring a small amount onto a plate that had been in the freezer for a while (to cool the jam down quickly). It wasn't setting as it should, so we added the juice of 1 lemon, as that causes the pectin to activate. After a second test, it was ready. I was too excited to remember to take photos of that part! The process of filling the jars is pretty messy, but Husband, who has made jam before, assures me that this is perfectly normal. 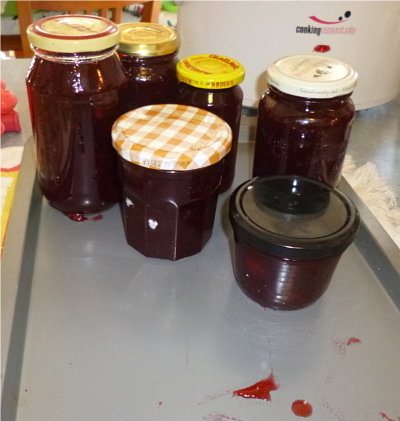 And there we are -- 6 jars of plum jam! 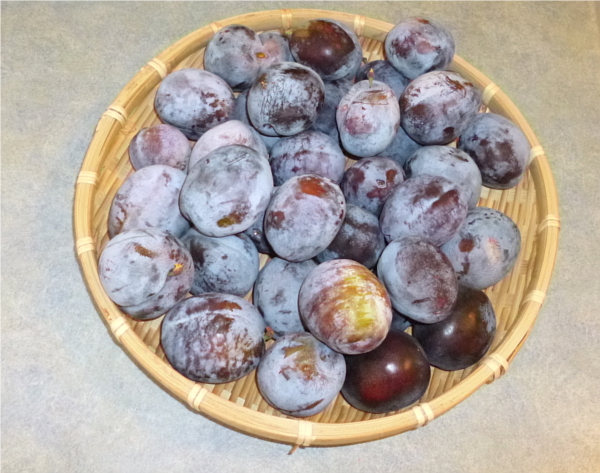 Maintaining fruit trees and making produce from their harvest is certainly some work, I have to say. Pruning the trees, watering them, covering them with bird netting, monitoring the fruits so they're picked at just the right time. 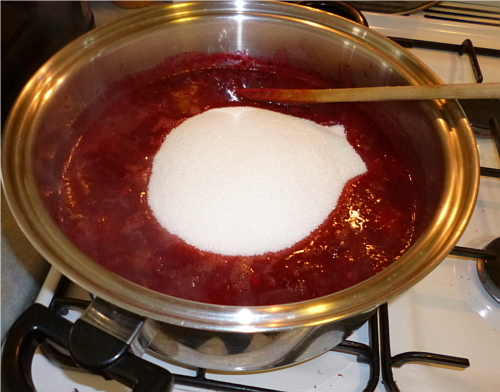 The process of making the jam was actually the least time-consuming; just over an hour. Sure, I could go to the supermarket and buy 6 jars of jam for $20 and save myself the time. I enjoy being amongst my trees, though. I love watching the ants run along the branches, and seeing the fruits slowly grow. I love the thought that I'll be doing the exact same thing this time next year. Now that all the fruit is picked, I thank my tree and say to it, "you can rest now". Later this year, our work together will begin again.